Summary and Definition: The Pomo tribe were a California tribe of Native American Indians who were hunter gatherers and fishers. They lived in Northern California, from the Pacific Ocean to Clear Lake (modern day Mendocino, Sonoma, & Lake Counties)The Pomo tribe endured cruelty and slavery at the hand of the Spanish, Russian and Mexicans. The Bloody Island Massacre (May 15, 1850) followed involving the US Army and Gold Rush settlers. What was the lifestyle and culture of the Pomo tribe? The Pomo tribe lived in parts of Sonoma, Lake, Mendocino, Colusa, and Glenn Counties in California. The word 'Pomo' means "those who live at red earth hole" in reference to their earth lodge pit houses that were built with a red colored earth as the winter homes of the tribe. Their tribal lands were subject to various incursions by the Russians, Spanish, Mexican and finally the Americans. The Pomo people were made slaves by many of these invaders and watched as their tribal lands fell to the Russian traders seeking sea otter furs, the Spanish who wanted to convert the tribe to Christianity, the Mexicans who forced the people to work on their farms and finally the Americans who moved west along the California Trail who were joined by the Gold Rush settlers. The Pomo were decimated by the diseases brought by the invaders and those who survived were forced on to various reservations. What language did the Pomo tribe speak? "Pomo" was actually seven Pomoan (Hokan) languages, spoken by the Southern, Central, Northern, Eastern, Northeastern, Southeastern Pomo, and Southwestern Pomo (Kashaya). Where did the Pomo tribe live? The Pomo are people of the California Native American cultural group. The geography of the region in which they lived dictated the lifestyle and culture of the Pomo tribe. What did the Pomo tribe live in? Tule Mat Lodges: The Pomo tribe of California lived in shelters of dome-shaped shelters called Tule Mat Lodges. To build the tule mat lodges, the Pomo men first created a circular willow framework. The size was about 7 feet in diameter and about 7 feet high. The Pomowomen harvested the long green stems of tule which were dried over several weeks. After the grass had dried, the women would weave and sew the tule rushes into rectangular mats about 2 feet wide. The tule mats were sewn together with dogbane (Indian hemp) and tied to the willow frame. An opening in the roof created a smoke hole. The doors of the Pomo tule mat lodges always faced towards the east and were built in sight of water. What food did the Pomo tribe eat? The food that the Pomo tribe ate included their staple diet of acorns which they ground into acorn meal to make a type of bread. The abundant species of oak trees on their lands produced seven different kinds of acorns. Fish an important food source, particularly salmon. The Pomo hunted deer (venison), elk, antelope, fowl, and small game such as rabbits and quail. The hunter-gathers collected other foods including buckeye nuts, pepperwood nuts, various greens, roots, bulbs, and berries. Most foods were dried and stored for use during the winter months. Coastal groups of Pomo people hunted for sea mammals and considered dried seaweed a delicacy. What clothes did the Pomo men wear? The clothes worn by the Pomo men varied according to the season. During the summer months the men wore a breech cloth or just went naked. In the winter months warm clothing was required and their winter clothing was made from the skins of animals such as deer (buckskin), elk, squirrel, rabbit and wildcats. The Pomo winter clothes included fur robes and cloaks, shirts, wrap-around kilts, mitts and leggings that were often decorated with fringes. They wore one-piece moccasins with a front seam whilst hunting or traveling, but went barefoot in the warmer weather. 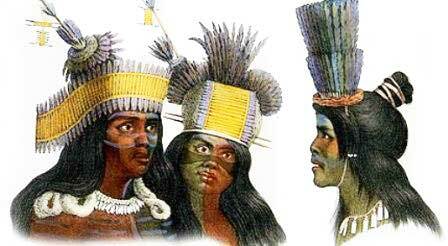 The headdresses worn for special ceremonies consisted of headbands made from flicker feathers (a flicker was a type of woodpecker) and plumes were added for further decoration. What clothes did the Pomo women wear? The clothes worn by the Pomo women included blouses and aprons that covered the front and back made of shredded willow bark. Their dresses or skirts fell to calf length and were belted and fringed. Special clothes were strung with ornaments, tassels and porcupine quills. Twined tule slippers, or moccasins, covered their feet in the winter and they wore fur robes to keep out the cold. What was the religion and beliefs of the Pomo tribe? What weapons did the Pomo use? The weapons by the Pomo people included spears, stone ball clubs, knives and bows and arrows. The sharp points of their weapons and their tools were fashioned from Obsidian. Pomo History Timeline: What happened to the Pomo tribe? The following history timeline details facts, dates and famous landmarks of the Pomo people. The Pomo timeline explains what happened to the people of their tribe. 1870: The Bole-Maru and the Earth Lodge Religion were religious revitalization movements of tribes in north-central California that grew out of the Ghost Dance movement. 'Bole' is a Wintun word and 'Maru' is a Pomo word both referring to the dreams of medicine people.